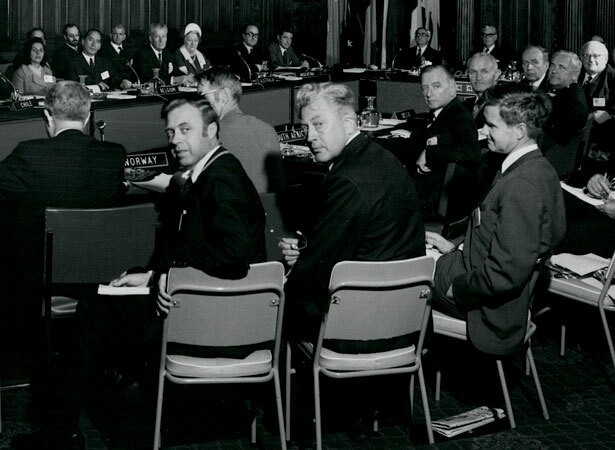 As claimant to the Ross Dependency, New Zealand took part in the 1959 conference in Washington DC about the political and international status of Antarctica. The resulting Antarctic Treaty was agreed to by the 12 participating states. In the midst of the Cold War, the treaty declared that ‘Antarctica shall continue forever to be used exclusively for peaceful purposes and shall not become the scene or object of international discord.’ Any measures of a military nature were outlawed, and nuclear explosions and the disposal of radioactive waste were entirely prohibited. Antarctica effectively became the world’s first nuclear-free zone. The treaty shelved the problem of territorial claims and the even more vexing problem of overlapping claims. It stated that nothing in the treaty could be interpreted as a denial ‘of previously asserted rights of or claims to territorial sovereignty’, and that activities taking place while the treaty was in force would not constitute a basis for claiming sovereignty. In addition, no new claims (or enlargements of existing claims) were permitted to be made during the life of the treaty. We have 3 articles, related to Antarctic Treaty comes into force .